Jim obtained his law degree from The Washington College of Law, American University, in 1987 and was admitted that year to the New Jersey Bar. He obtained his undergraduate degree from Mount Saint Mary’s College with a double major in Political Science and Economics. 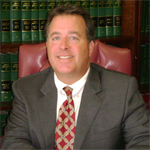 Jim has many years of experience handling all types of litigation including personal injury, workers’ compensation, municipal and land use matters. Jim also handles a variety of municipal appointments and is currently the Piscataway Zoning Board Attorney, Spotswood Planning Board Attorney, South River Zoning Board Attorney and Franklin Township Zoning Board Attorney. His past appointments also include the position of Manasquan Municipal Attorney, as well as attorney for various zoning and planning boards including Keansburg, Manalapan, Marlboro and North Brunswick. Jim is also actively involved in his community. He is a member of the Advisory Board for the Academy of Finance, Manasquan High School, and formerly was a member of the Executive Board and a Coach of the Manasquan Brielle Little League. Jim is also a former Councilman for the Borough of Manasquan and a former Planning Board Member. Member, Advisory Board, Academy of Finance, Manasquan H.S.